SWT’s Commercial Sediment Filters are built utilizing SWT’s FilterEase-HD™ filtration media. 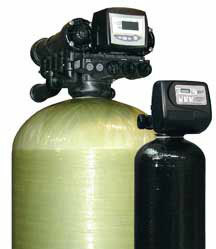 These units are a popular alternative to sand and other filter aggregate systems. FilterEase-HD™ Filters feature the superior filtration characteristics of our original FilterEase™ Filters, yet have backwash rates similar to that of anthracite. These filters are designed to remove ferric iron, silt, and turbidity, and are preferred when higher backwash rates are desired for cleaning iron and silt from the filter bed. Sediment filtration down to the 10 to 20 micron level is common. SWT takes care of the little extras such as: machined PVC distribution systems and gravel underbedding to prevent channeling. † For superior filtration, reduce flow rates by 1/3 of the standard flow rate specification. * Available with 2 inch MNPT connections. 1.5 inch & 2 inch systems have a no-unfiltered-water bypass option available. All pressure vessels are wound fiberglass, reinforced polyethylene or polypropylene copolymer, and are NSF® listed.